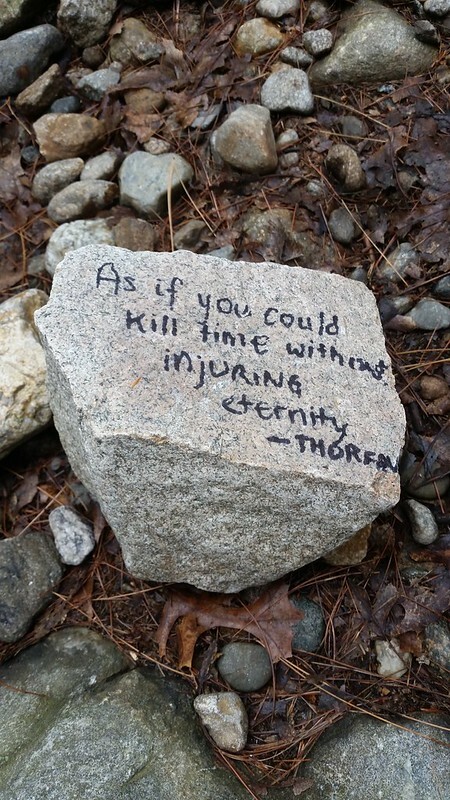 A rock near Henry David Thoreau's cabin with a message written on it: "As if you could kill time without injuring eternity." There were an abundance of rocks with various quotes upon them near Thoreau's cabin on Walden Pond. But I really liked this quote in part for it's content, but in part because of how the content contrasted with both the tool that it was written with and the object it was written on. It was written with permanent marker, something that suggests eternity but isn't and written on a rock, something that can seem eternal to humans but is not. Both the rock and the message on the rock appear to be just "killing time" waiting for people to come and engage with them and therefore are potentially injuring eternity (their own eternity?) by doing so.